Yesterday we had Arancini (deep fried risotto balls) , using the leftover risotto. I seasoned it, even more, this time. I made parsley and parmesan breadcrumbs in Thermy (fantastic, thank you). Next time, I think I'll add the additional seasoning to the leftover risotto before I put it in the fridge. This is because the risotto was very well set, perfect for forming into balls... but I had to stir it up to stir in the seasonings, and that made it all loose again. I also made another batch of hummus, this time I added some moroccan seasoning. I think it was a bit too thick, I should have slackened it off more. I also should have added more lemon juice. I'd bought a new jar of Tahini, as I hadn't got round to ordering sesame seeds to make my own. (That's now rectified - or it will be when my Wholefoods order arrives - so I'll be in good shape when the Tahini jar runs out). While I was shopping, I also took some photos of Waitrose's hummus varieties - the backs of the packs, anyway, so I could see what they put in theirs. I saw that I can use Tahini to make Baba Ganoush, so I bought an aubergine as well...but I haven't go round to it yet. Hopefully I will do so before the Aubergine walks out of the fridge. This time, I cut the ginger into hald and 1 inch pieces before freezing. Ha! I decided to try Rye and Millet bread, in my breadmaker. I had both millet flakes and millet seeds, from when I was buying grains to tempt my housechook to eat. I needed some millet flour as well, and was childishly excited that I could use Thermy to do this. I feel very proud of my 50 grammes of millet flour. No idea what the bread is going to taste like, but that isn't the point. It's just gone into the oven, so I'll find out later. I took the frozen pizza dough out of the freezer, so it could defrost for dinner tonight. The wrapping said "needs second rise", so I after it was defrosted, I put it in a bowl in the airing cupboard. I realised that it would probably have been quicker to have made fresh dough from scratch. I used to make my pizza dough by hand, painstakingly stirring the middle while the flour gradually slips in. Then I started to cheat, and used my KitchenAid, on the basis that the planetary action is sort of similar to doing it by hand. In both these cases it's been worthwhile making double and freezing one. Now I'm not so sure. It was really quick in Thermy, and the taste and texture was fine. That's a bit of a Thermy revelation. 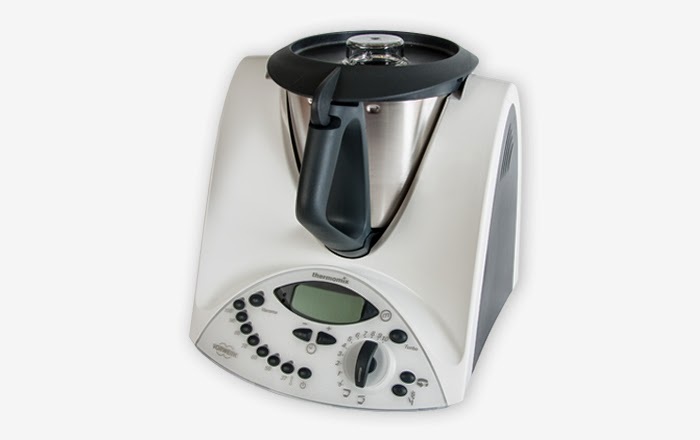 I've been following your Thermomix blog with great fascination, since we too have toyed with the idea of a Thermy. So far we've resisted. But baba gaboush, you say? A really good baba ganoush would alone justify the cost for me - one of my favourite foods. Please do report back on that particular recipe!